Catch up on the latest energy updates. Cushman & Wakefield and Premier Energy Auctions have released their latest Market Energy Update. 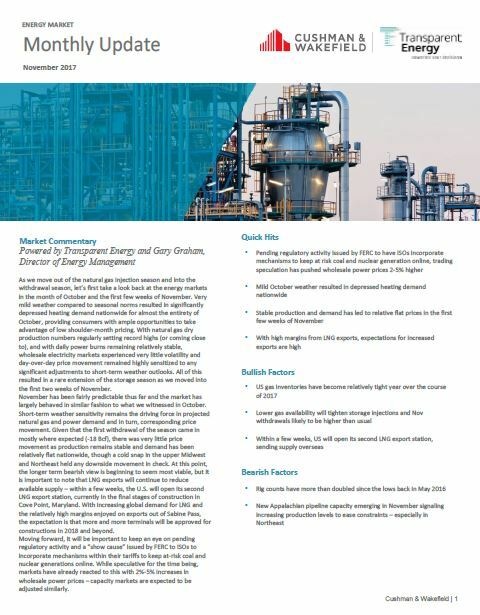 This publication provides an overview of the economic, geopolitical, and meteorological factors affecting the energy market. Mild weather results in depressed heating demand. This latest issue details how mild weather in October and November resulted in significantly depressed heating demand nationwide. The trend provided customers with ample opportunities to take advantage of low shoulder-month pricing. Additionally, with natural gas dry production numbers regularly setting record highs, and with daily power burns remaining relatively stable, wholesale electricity markets have experienced very little volatility. Looking ahead, there are a number of factors to be bullish about. U.S. gas inventories have become relatively tight over the course of 2017; lower gas availability will tighten storage injections; and the U.S. is about to open its second LNG export station, sending supply oversees. To learn more about these development and to get the latest electricity price trends, natural gas data highlights, and temperature probabilities, read the full energy update. If you have any questions, Gary Graham, our director of energy management, can take you through the report and answer any of your questions.